Its not every day you make the cover of the famous broadsheet The Times. 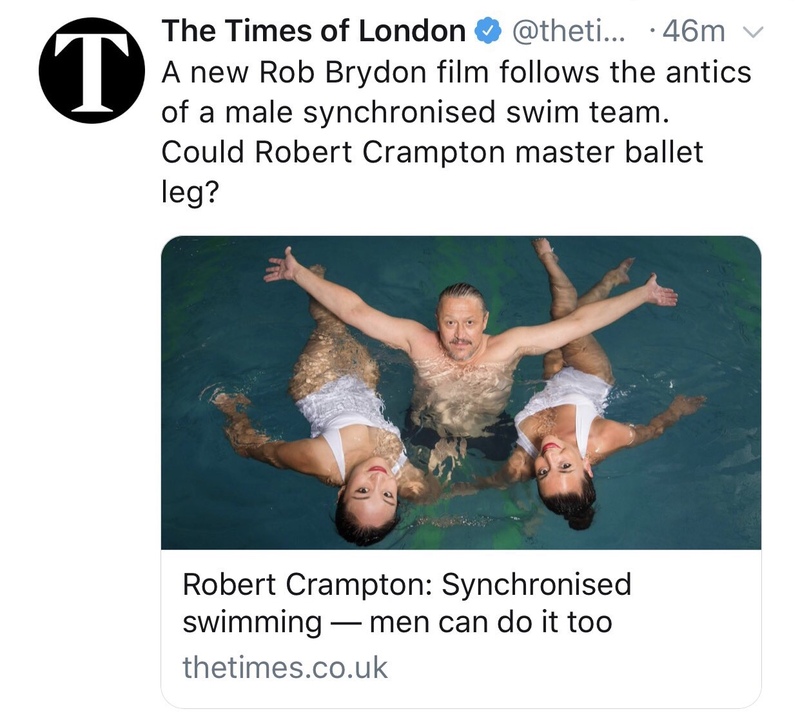 With the new Rob Brydon comedy Swimming With Men out in cinemas next month and the French following suit with their version Le Grand Bain, Aquabatix was asked to teach renowned Times journalist, Robert Crampton, some synchronised swimming moves for a feature in The Times T2 section. With GB Olympian Asha Randall and former synchro swimmer in China, Yixin Zeng in the pool, Aquabatix Director and former High Performance Manager of the British synchro team, Adele Carlsen, took Robert through his paces in the pool. Showing him the basic moves of sculling and eggbeater and then moving onto the tub, oyster and ballet leg, Robert tried his hand at all the moves. Whilst struggling a bit with the more technical difficult moves of eggbeater and ballet leg, Robert’s Oyster was almost immaculate for a beginner! With some striking images, taken by photographer Neale Haynes during the session, Aquabatix made the cover of The Times T2 section when it was published. Not only did the feature make the cover of that section but The Times also put the feature on their main front page of the paper.